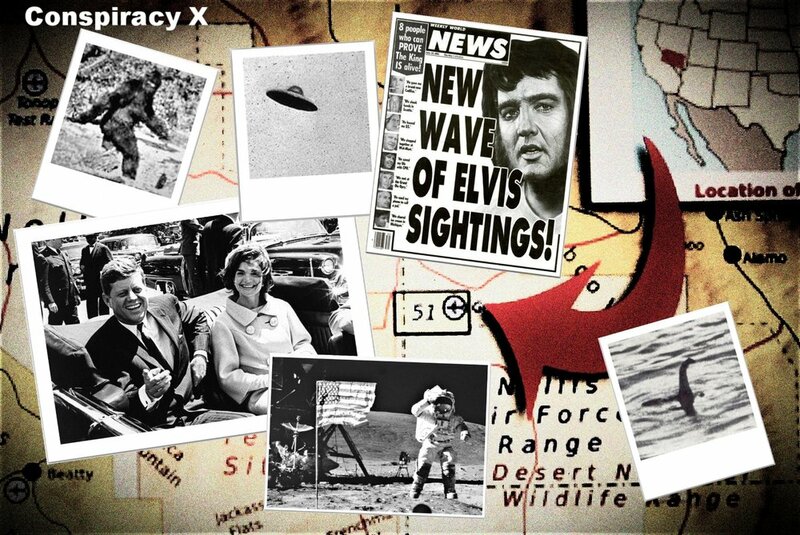 Play if… you truly still believe that Elvis is alive or the pyramids were built .by aliens. Avoid if…you have a friend who is a conspiracy theorist who is always trying to get you to believe his/her stories (our condolences). Description (from the company website): Obsessed with conspiracy theories, a friend sends a final desperate message: one of his theories is true! Separate fact from fiction before time runs out! An intriguing mystery for up to 8 investigators. Staging Area: They put us in a small waiting room with chairs and then came in to give us the briefing. 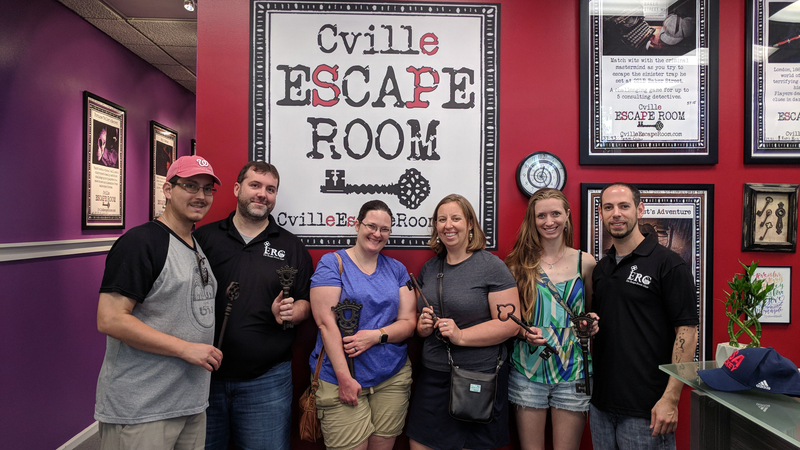 It’s cool that Cville Escape Room has a Lock & Key Club for players who have done 4 rooms at this location. 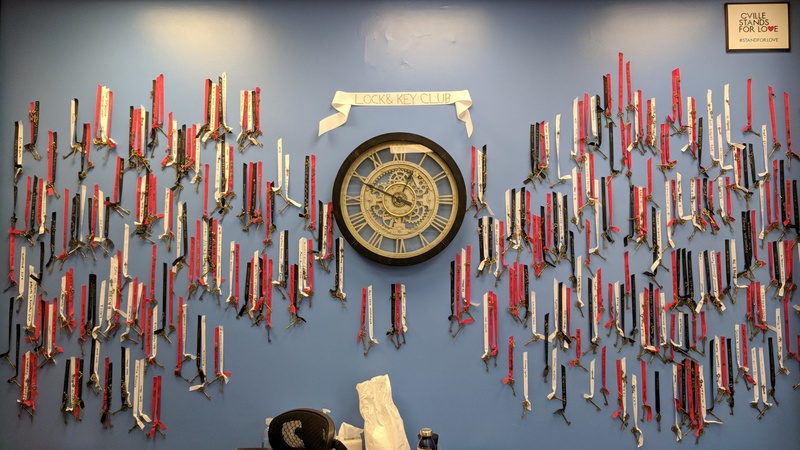 Once you hit your 4th room, you get your name on a ribbon attached to an antique key, and for every successive room, you get a small key pin added to the ribbon. Description of the room: The room is a cluttered apartment littered with stuff all around, and tons of posters, newspaper articles, and other stuff on the walls. Understanding of the Mission: We have to explore the different conspiracy theories of a friend of ours (who has since gone into hiding) to determine which conspiracy theory is correct. Our Suggested Party Size: 6 was good, but only if you have experienced people with you (there is a LOT to do in this room… see below). Play if… you like a good mystery, groping around in the dark, or you’re just plain weird. Avoid if… you are claustrophobic or are prone to getting seizures. This room is NOT for kids. Description (from the company website): For months, Dave has been haunted by a tragic memory. Every time he closes his eyes he is forced to re-live devastation and loss. This room, a specially made experience for two people, is a dark and intense exploration into the mind of our main character, and it is up to you to save him from himself. Enter the dream and help Dave recover, because in 30 minutes he will wake to the greatest adventure of his life. (see House Arrest). Note: This experience may be intense for individuals who are sensitive to low light situations, confined spaces, and eerie audio/video effects. All minors must be accompanied by an adult. Staging Area: The location is downstairs in the strip mall and does not have an outside door to the parking lot (you have to go in through the building and down the stairs). Waiting area is clean, several chairs; place looks nice and cozy. Metro Access/Parking: There’s no metro or anything nearby, but there is plenty of parking. Description of the room: You are in a mostly-dark room that’s about 3′ x 12’… we can’t describe anymore without spoilers, but even that small space seems… smaller for some reason. Understanding of the Mission: We set out to learn what’s keeping Dave up at night and how he became a conspiracy theorist. Time Remaining: About 3 minutes (we had some technical difficulties at one point, so we lost about 3 additional minutes). Our Suggested Party Size: Must be 2 people. It’s physically impossible to do this on your own. Play if… your sleuthing skills are high and you love the smell of books. Avoid if… you hate libraries. Description (from the company website): The Silver Lining computer virus is spreading and the world is now on the brink of total collapse. Alfred Roland, the CEO of Locus Industries, is harnessing its power to locate items of great value without remorse of the destruction it is causing. He is hosting a party at his private manor and Dave has been put on the guest list, thanks to some help from a friend. Jump into Dave’s shoes and sneak into Alfred’s study to disable the core of the virus. It’s a stealth mission, and security is on high alert at this corrupt billionaire’s abode. Description of the room: You start off in a library surrounded by books. There’s a desk, a full wall of bookcases, and a podium with a map. Understanding of the Mission: We had to break into the office and find out how to steal the virus. And then escape. Our Suggested Party Size: A slightly larger group (7/8) is great for searching this room, as there’s a lot to look for. 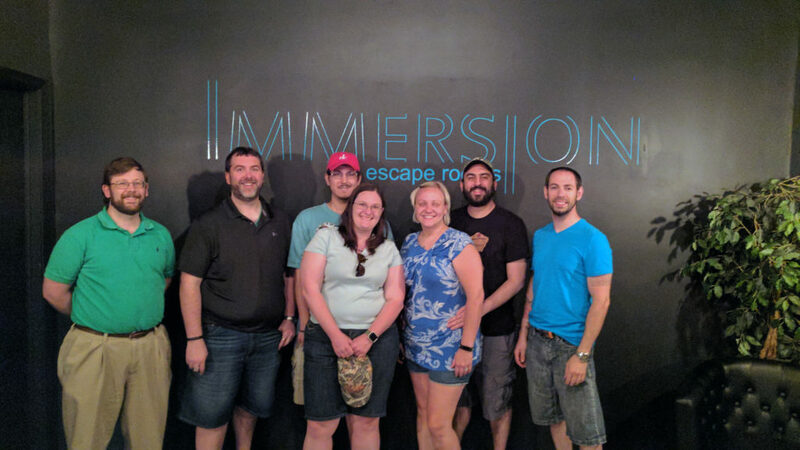 Team Disturbed Friends (Rohan, Amanda, Mike, Corey, Brittany, Mike and Jason) infiltrated the Lion’s Den and found the code for the computer virus! Play if… you live in a messy house or apartment. Or you think escaping death is thrilling. Avoid if… you are prone to wetting yourself or truly believe the moon landing was faked. Description (from the company website): The world is heading for a catastrophic collapse since the release of Silver Lining, a cloud-based computer virus developed by Locus Industries. Dave Benson, Chicago journalist and conspiracy theorist, knows this and Locus will stop at nothing to keep him quiet. Enter his apartment and retrace his steps during the final moments leading up to Locus’ arrival at his door. Does he get out in time? The story is in your hands. Difficulty (1-10): N/A – website lists a 40% success rate with a record of 36:45. Description of the room: You enter a small studio apartment that is somewhat in shambles. Obviously, the person living here has other things to be concerned about than regularly cleaning the place. Understanding of the Mission: Escape your locked apartment before agents from Locus Industries show up and cart you away. Time Remaining: Roughly 2 minutes. 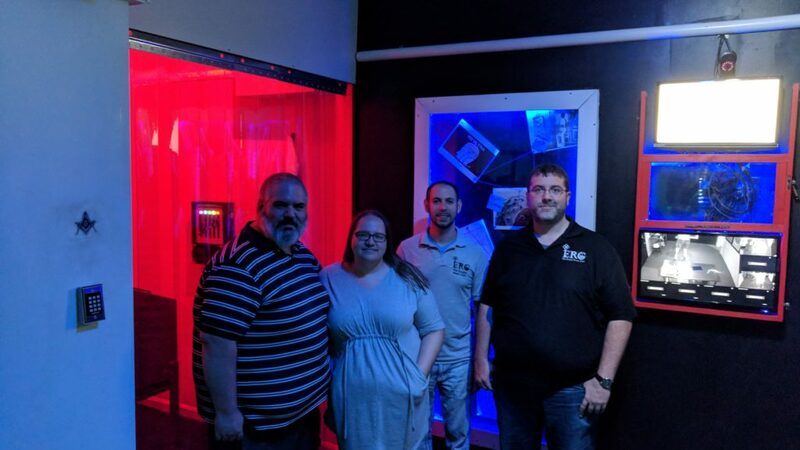 Team Disturbed Friends (Rohan, Mike, Corey, Brittany, Amanda, Mike, and Jason) embraced our inner conspiracy theorist and escaped our apartment before being captured by some very bad men. 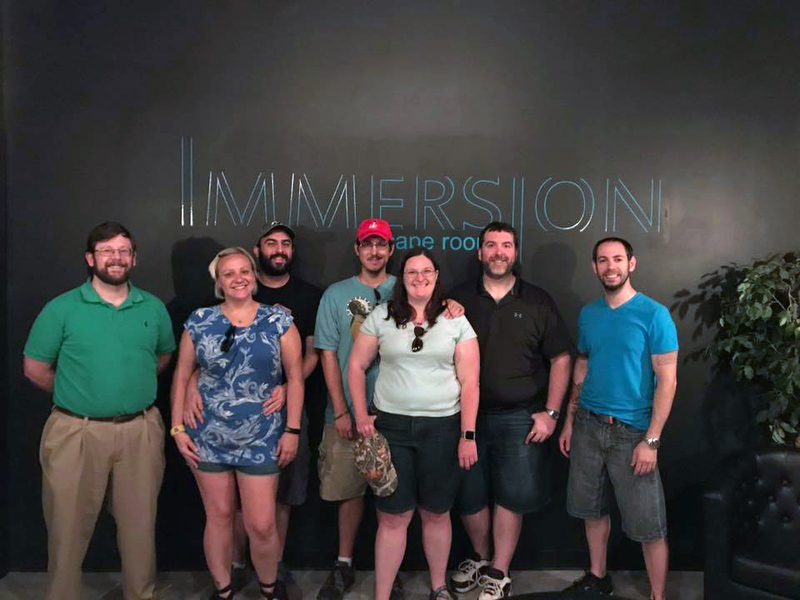 Photo courtesy of Immersion Escape Room’s Facebook page.